Scratching is a very natural behavior for cats – it is a normal part of grooming and communication. Cats scratch to condition their claws by removing the old nail sheath. The sheath and the scratch mark left behind act as a visual marker of territory. Cats have scent glands in their pads and this also acts as a marker. Finally, the act of scratching is a display of confidence to any feline onlookers. Trying to stop this innate behavior is difficult if not impossible. Instead, train your pet by directing scratching to an acceptable place and trim their nails regularly. If your cat already scratches, it may take a little more time and effort but you can teach an old cat a new trick. 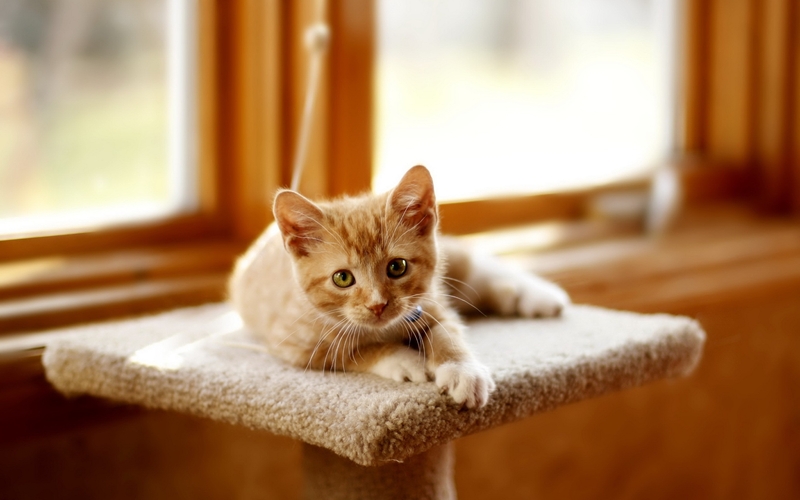 There are a variety of scratching posts on the market – it’s a matter of determining what your cat likes. If your cat doesn’t scratch yet – carpet and sisal seem to be popular with felines and in my experience – most cats love a piece of wood. If your cat already scratches, watch him and see what and how he scratches. Then make a post covered in the material he likes. If he stretches up to scratch place the post vertically but if he stretches out – then place the post horizontally. Either way, the post should be secure so that it won’t fall and deter your cat from revisiting. To make posts more attractive – place them in a preferential area spritz them regularly with catnip spray. Furniture should be made less attractive to cats by covering with tinfoil or tape sticky side out. Deterrent spray may also be used. Some cats will go immediately to a post. Others may require more work. Repeatedly taking your cat to the scratching post and mimicking scratching with his front paws will show him it is the acceptable place to scratch. Consistent positive reinforcement is vital using praise, petting and food rewards whenever he uses the post. On the other hand, when inappropriate scratching is seen, correction should be immediate. Use your voice, pennies in a can or a spray water bottle to startle your cat. When you are not home to see what’s happening deny access to areas of concern. Close doors or use baby gates. Consider electronic fencing, which will correct your cat when you cannot. When a cat’s nails are trimmed regularly – they are flat and are not able to do much damage to furniture or people. Nail trimming is generally tolerated well, especially when started at an early age. Handle your cat’s feet regularly and try trimming the nails when he is relaxed. Never trim after you have just corrected for inappropriate scratching as he may associate nail trimming with punishment. Keep trimming sessions fun and only as long as your cat will tolerate. There’s always tomorrow to try again. Declawing should only be performed as a very final resort. The most common type of declawing is a very invasive surgical procedure that removes the cat’s digit from the first joint down. The alternative procedure involves cutting a tendon in the cats paw so they cannot retract the claws. Cats must still have nails trimmed post-surgery to prevent injuries from nails getting caught. While most cats recover uneventfully from declawing, some cats develop what is known as “phantom pain” and appear to experience pain long past the usual recovery period. For cats using scratching as a means of marking territory, there may be an attempt to mark by urinating or defecating outside of the litter box. Some cats that were biters and scratches prior to declawing may begin to bite more frequently or harder after the procedure. Furthermore, when cat owners have a change in their living circumstances, many feel it would be nice to let their cats out and regret having declawed their cat. Some owners let their cat out anyway – this is not fair or safe as a major defense mechanism is now missing for these cats. If you need help training your cat or trimming nails please contact us for advice.